The FBI's seal, shown here in a photograph, is the subject of a legal dispute between the bureau and Wikipedia. (CNN) -- The U.S. Federal Bureau of Investigation has threatened Wikipedia with legal action if the online encyclopedia doesn't remove the FBI's seal from its site. The seal is featured in an encyclopedia entry about the FBI. Wikipedia isn't backing down, however. The online encyclopedia -- which is run by a nonprofit group and is edited by the public -- sent a chiding letter to the FBI, explaining why, in its view, the FBI is off its legal rocker. "In short, then, we are compelled as a matter of law and principle to deny your demand for removal of the FBI Seal from Wikipedia and Wikimedia Commons," the Wikimedia Foundation's general counsel, Mike Godwin, wrote in a letter to the FBI, which was posted online by the New York Times. "We are in contact with outside counsel in this matter, and we are prepared to argue our view in court." The whimsically written letter from Wikipedia says the FBI's reading of relevant law is both "idiosyncratic" and "more importantly, incorrect." It also notes that the FBI's seal appears on other websites, including in an online entry from Encyclopedia Britannica. In a letter dated July 22, and also posted online by the Times, the FBI told Wikipedia it must remove the bureau's seal because the FBI had not approved use of the image. "The FBI has not authorized use of the FBI seal on Wikipedia," the letter says. "The inclusion of a high quality graphic of the FBI seal on Wikipedia is particularly problematic, because it facilitates both deliberate and unwitting" copying and reprinting of the seal's image. The FBI's deputy general counsel, David Larson, cities a particular law that says duplicating an official "insignia" is illegal without permission. But Wikipedia strikes back on that point, saying the FBI redacted the most important part of that U.S. code, which defines an insignia as "any badge, identification card, or other insignia." "Badges and identification cards are physical manifestations that may be used by a possessor to invoke the authority of the federal government. An encyclopedia article is not," Wikipedia's letter says. "The use of the image on Wikipedia is not for the purpose of deception or falsely to represent anyone as an agent of the federal government." "Even if it could be proved that someone, somewhere, found a way to use a Wikipedia article illustration to facilitate a fraudulent representation, that would not render the illustration itself unlawful under the statute." It's unclear if this tussle -- which has already made its way into a Wikipedia entry on the FBI's seal -- will be taken to court. For now, the tech press is weighing in, often with amazement. 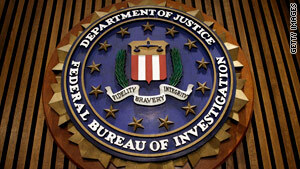 On the blog BoingBoing, Rob Beschizza writes that this is a no-win situation for the FBI. "The part that's hard to understand is why the FBI would seek to abuse the law in such petulant fashion," he writes, "knowing that it will be subject to public ridicule for its actions." The magazine Vanity Fair posted the FBI's seal on its website in a symbol of jest. And, as the blog Geekosystem says, an editor on the site aggregator Reddit jokes that maybe the FBI got Wikipedia confused with WikiLeaks -- the site that's been causing a stir lately over leaked war documents. Cindy Cohn, from the Electronic Frontier Foundation, told the New York Times, which first reported this story, that she found the whole ordeal to be "silly" and "troubling."